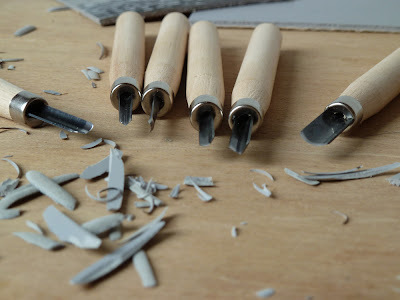 I am often asked where to get good quality economical tools for linocut. I’ve tried a lot of different brands and styles, from the ubiquitous Speedball kits with the red handle and removable blades, through to the professional quality but quite pricey Pfeil tools that I use for my own work. 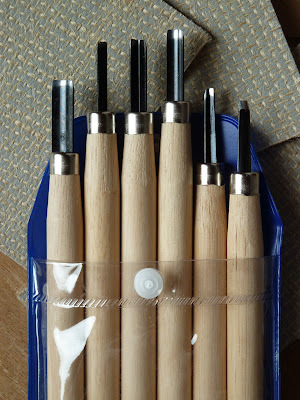 Most of the cheap lino tools you can buy are rubbish. The main problem is that they use poor quality steel and are not sharp enough. When you use them they tend to tear the lino, rather than cutting it cleanly. With a lot of the Chinese and Japanese sets you get a knife (hangito) and a little chisel. These are useful for making Hanga prints if you’re a budding woodcut artist but for carving lino I find I literally never use them. So instead, with this set you get more tools you will actually use! If I find there is a demand for these, I am thinking of producing a Linocutboy starter kit with tools, lino, ink, roller and baren. So let me know if you think it’s a good idea and there’s a gap in the market! The tool kit comes in a nice little plastic carrying pouch. 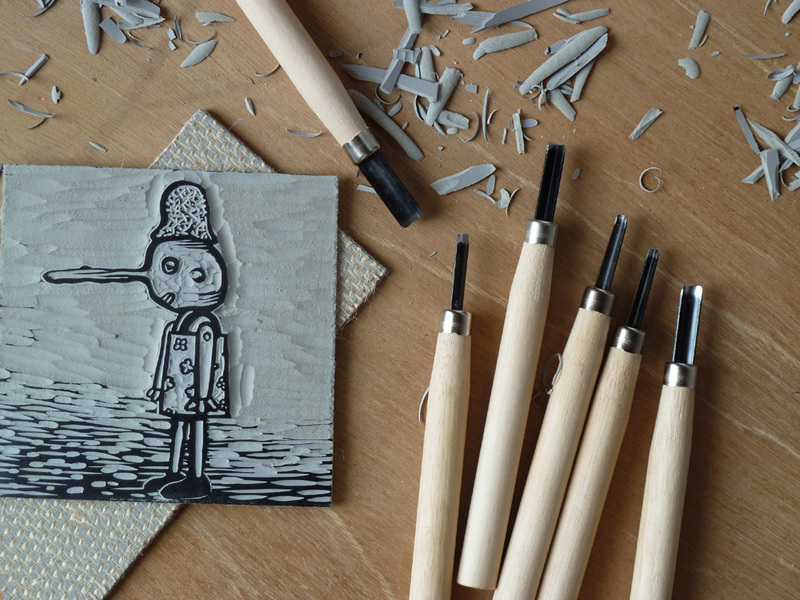 Here’s a quick little linocut I made using the tools. You can get very good detail, especially with the V tools. The toolset is available from my Etsy shop. Perfect for beginners or as a gift for someone special. Ah! Just what I need as I flung my rubbish school-kiddy quality ones out the window in disgust the other day. Nothing else available on this island. An excellent idea! I'm not a fan of the speedball ones as they don't give as much detail – are there any more for sale? I'd love to get a set! I am definitely interested in a set of these! Please let us know when to expect more tools on your etsy site… there are none there now! I've ordered a load of these now. Will be selling them through my etsy shop very soon. Inspired by the Guardian article I just tried to buy a set, but there seems no way to place an order. Does that mean you're out of them again? Yes, sorry! They were really popular. I've ordered 50 more sets but they won't be arriving until the end of February (they're coming from Korea!) I'll let you know when they're in and make sure you get a set if you want one. Hi, just wondering if there are any kits available now? I have a state exam in art in may and would love if I had these by then for the lino prints I have to do for it! Hi, wondering did you restock the linocut tools that you raved about. They seem ideal for a new start artist such as myself, I need good quality but not prohibitively expensive tools to test the water before I plunge all in to the world of linocut art. There’s still demand for these!! have you got any more of these tools? would love to buy them! I just wanted to say that I bought your starter kit a few years ago that included these tools and it is still brill – just what I needed to get up and running and great quality. so thank you! If and when these become available again, I would love to know. You are right, it’s completely hard to find a decent set without paying a fortune, and I’d like to start a lino group with my girlfriends, so we’ll need multiple sets to make that work. Thanks for spreading the lino love! Also very interested in this set, do you think you will get more?